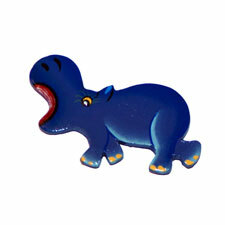 This charming wooden hippo magnet will romp across your refrigerator, giving you a smile each time you open the door. Painted blue, he is handmade in Haiti by Fair Trade craftsmen. Buy several for an entire herd!